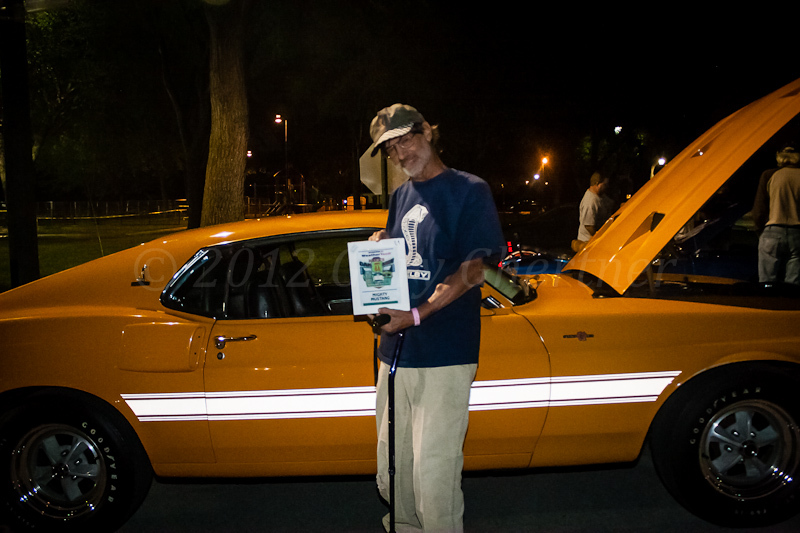 This annual event was held at Hodgkins on Saturday September 8th and 110 cars participated. Music was CDs and the band Hillbilly Rock Starz performed a concert (my coverage at this link) just a few hundred yards away in Hodgkins Park. Here are some of the tunes we heard from the DJ. Regular blog readers will see four familiar cars in my teaser gallery. Allen brought his 1969 Shelby Cobra, which had won the Mighty Mustang award at the Berwyn Route 66 Car Show earlier in the day (but I didn’t see him earlier because the show was so big). Allen has several cars and this one has been his ‘steed’ for 12 years. It has a 428 Super Cobra Jet motor (SCJ). The basic strength of the Super Cobra Jet engine is in a more durable reciprocating assembly (crank, rods, pistons, flywheel/flexplate, and harmonic balancer) that was designed to withstand the higher RPM requirements of drag racing. For example, the SCJ used race-proven 427 “LeMans” capscrew connecting rods, whereas the standard CJ rod used a more common press-fit bolt and nut to retain the rod cap. The SCJ timing pointer is slightly longer to clear the larger harmonic balancer. We observed a tribute to the victims of the 9/11/2001 attacks on the United States and the great Ray Charles’ rendition America the Beautiful sounded as good as ever. Listen for yourself. This entry was posted in Uncategorized and tagged 2012, Car_Show, Hodgkins, YouTube_Links. Bookmark the permalink.